You want more custom GTX 1080 Ti news? Well you’ve got it, as Gigabyte has teased three new powerful graphics cards. Available from this Friday, you’ll be able to get yourself a Gigabyte GeForce GTX 1080 Ti Gaming OC, an Aorus (a subsidiary of Gigabyte) GeForce GTX 1080 Ti 11G, and an Aorus GeForce GTX 1080 Ti Xtreme Edition. The pick of the bunch is that Aorus GeForce GTX 1080 Ti Xtreme Edition, and it’s so extreme they’ve cut off the first E. In Gaming Mode you’ll get a base block speed of 1607 MHz and a boost clock speed of 1721 MHz. In OC Mode, you’ll get 1632 / 1746 MHz base / boost. All of these numbers are rather healthy overclocks over the Founders Edition card with its 1480 / 1582 MHz base / boost clock speeds. This card’s memory speed has also been giving a jolt, up to 11.23 GT/s in Gaming Mode and 11.45 GT/s in OC mode. Of course all this extra power needs some serious cooling, which the custom 3x 100mm fan solution should handle nicely. It’s also got RGB lighting across the big X found on the front of the card, as well as the logos on the top and back. As for ports, the card is designed with VR in mind, with an extra front facing and two rear facing HDMI ports. Plus, you’ve got three DisplayPort 1.4 ports on the back. It seems like the only thing this card doesn’t have is a built in LCD display. 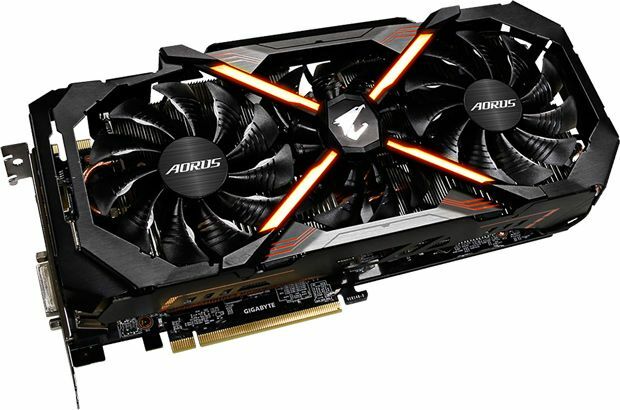 The other Aorus card, the GeForce GTX 1080 Ti 11G will be cheaper than its bigger brother thanks to the lower clock speeds and the lack of RGB on the backplate. In Gaming Mode you’ll get 1569 / 1683 MHz base / boost clock speed, and in OC Mode you’ll get 1594 / 1708 MHz. The memory hasn’t been boosted on this card, but most of the other bells and whistles remain. As for the Gigabyte branded card, the GeForce GTX 1080 Ti Gaming OC, you’ll find a white faceplate over the slightly smaller triple fan Windforce cooler. The logo on the top of the card is decked out with RGB, but you don’t get all the port options like you do on the other card. You’ll find a dual-link DVI-D output, an HDMI 2.0 port, and three DisplayPort 1.3 ports. The speeds are slightly lower too, with 1518 / 1632 MHz base / boost clock speeds in Gaming Mode, and 1544 / 1657 MHz in OC Mode. Keep an eye out for prices when they go live later this week. In the meantime, you can check out what we think of the GTX 1080 Ti so far.